Is it really July already? Crazy, right? July is always a lovely time for sewing here in Australia. Winter is in full swing. The days are short, the weather is cold and stitching indoors is ideal. It’s probably how all of you ‘Northern Hemispherers’ feel at Christmas time. At this time of year, we celebrate ‘Christmas in July’ instead. 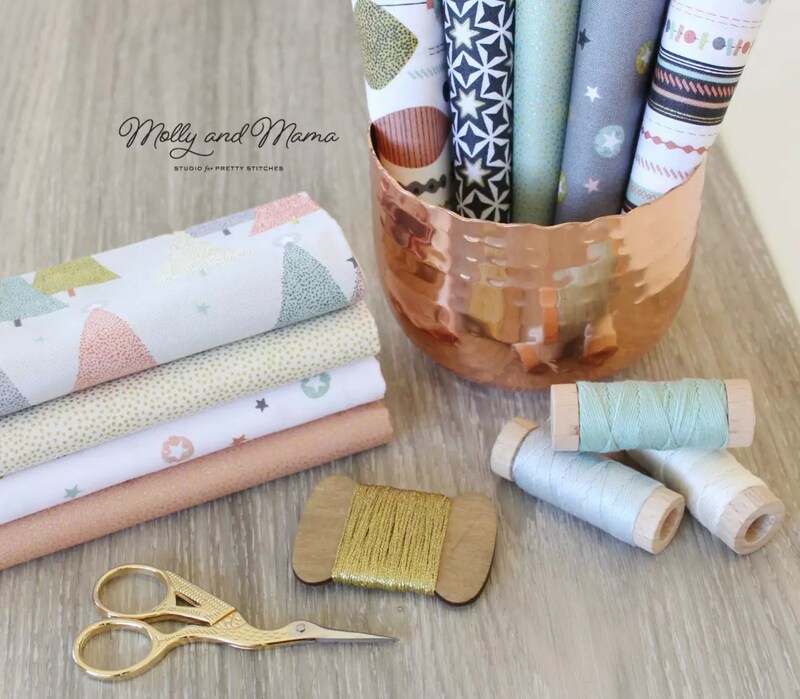 Recently, I was lucky enough to be able to play with some of the new Christmas fabrics in the Makower range; Modern Metallics. Australian wholesaler Two Green Zebras sent me this gorgeous fat quarter bundle and it took me ages to decide what to make with it! The colours are not something I would usually choose, but I was really drawn to the peach, sage and cream plains with gold dot detailing. They have just a hint of sparkle! And though the range is not traditional, the other prints really showcase the Christmas theme, with Christmas trees, baubles and stars. But if you’re more of a traditionalist, you’ll be pleased to know that Modern Metallics comes in a red colourway too. I liked the geometric design print and wanted to try my hand at fussy cutting, so decided to make an ‘English paper pieced’ six pointed star using 2″ diamond shapes. It was a little fiddley, because the defined lines and shapes don’t leave much room for error. But I am pretty happy with the results for a first attempt. 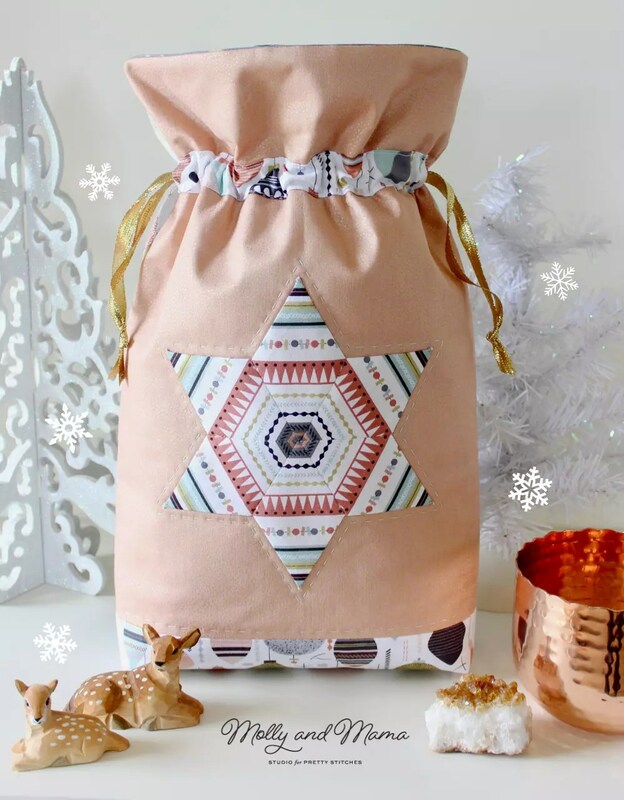 I thought the star would make a striking detail on a gift bag so I designed a simple lined bag with a boxed base and a drawstring top. The plain peach fabric was the perfect back drop for my paper pieced star! Aurifil thread in 30 weight was used to hand quilt around the star and the bag base. The other print fabrics created a balanced contrast for the boxed base, lining and back of the bag too. And the whole thing was finished off neatly with some vibrant gold ribbon pulls! I’m looking forward to using this one for a special gift this Christmas. If you’d like a pattern for this bag, please let me know. If there’s some interest, I’d be happy to share how I made it. And if you’re interested in the fabric, please ask your local quilt store to order it in for you. I’d love to learn now to make this! Yes would love the pattern. Never too early to start sewing for Christmas. I am sewing your little mice in stocking ornaments and the dove bauble. Pretty please for a tutorial on this one. Glad I stumbled across it as it’s perfect for what I was thinking for some gifts 🙂 Thanks in advance! What a lovely bag! I would appreciate your sharing thd pattern. Thank you so much. This is so cute and practical – a gift within a gift or a recyclable gift wrap. I would love the pattern. 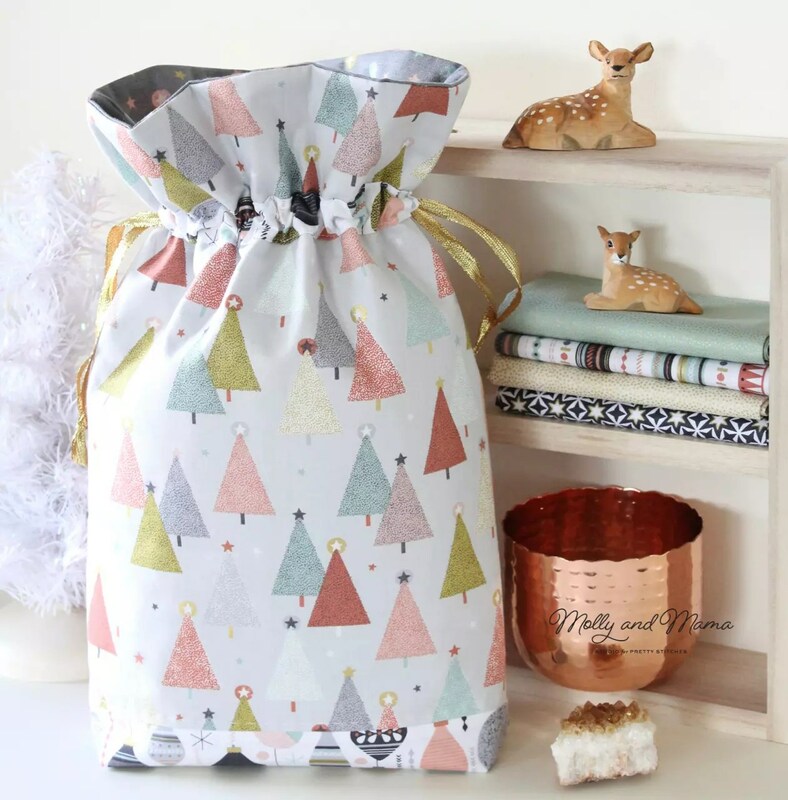 Hi there- I absolutely love the drawstring gift bag and would love the details on how to make it. Very stunning fabric selection as well! 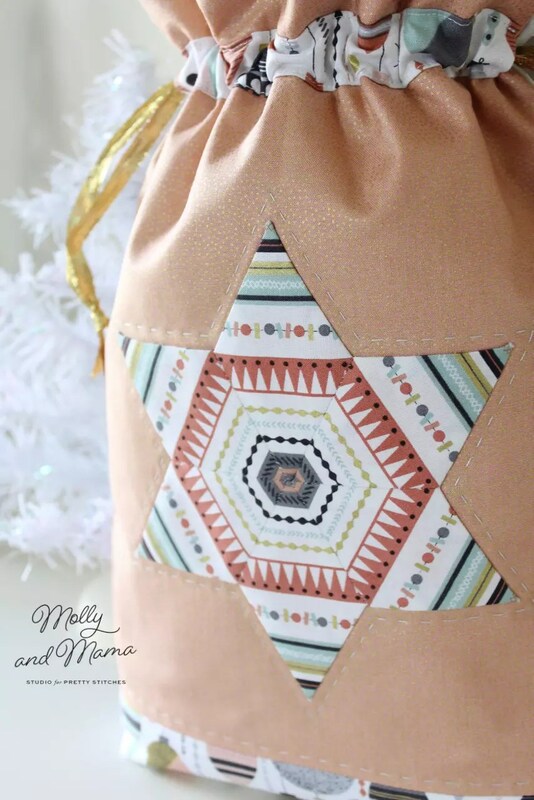 I would also love to learn how to make this pretty bag! I would love a pattern and/or a tutorial on how to make the bag – it’s super cute!!! What a pretty bag! Would love a pattern or instructions if you make them available. Bags are so fun to make! Would love to see a tutorial on this. Thank you! Love this bag. Please share the pattern. 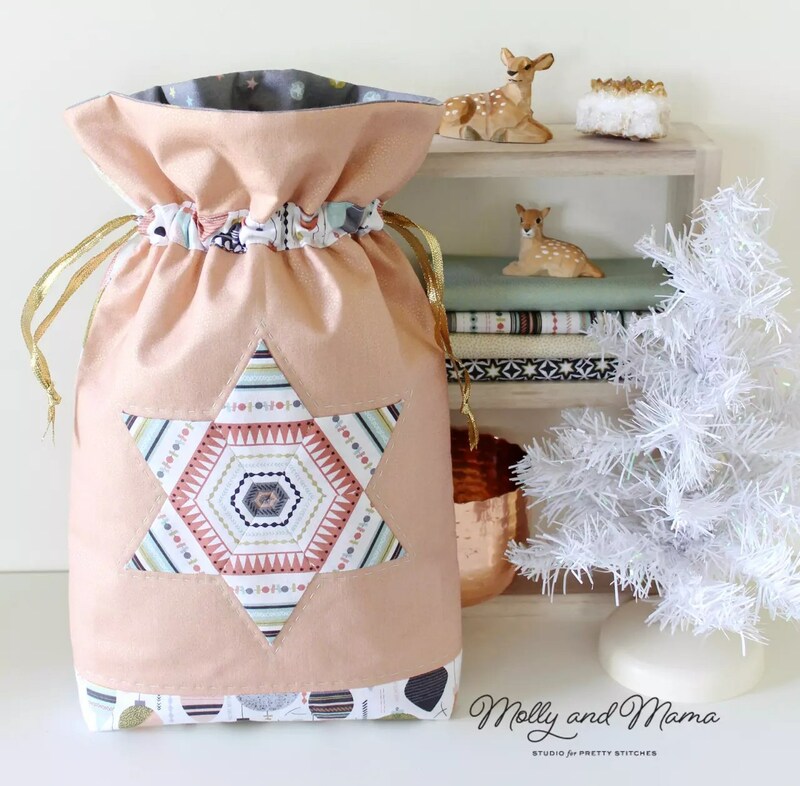 I saw your Christmas gift bag in the Hawthorne Fabrics newsletter and it led me to your blog. I would very much like to have access to your pattern if it becomes available. I’ve made drawstring bags before but don’t quite understand how you did the different fabric where the drawstrings go through. I’m looking forward to receiving your monthly blog. Beautiful Bag. I would love the pattern and instructions. beautiful bag-I’d love a tutorial or pattern too, although I’m going to be rather busy making lovely things from your new book! I would love a pattern or tutorial for the “Christmas in July with Makower 6pt star. It is so cute. Thank you.